Rivalries are a part of competitive sports. Here in the U.S. we look at Yankees-Red Sox, Lakers-Celtics, or Giants-Dodgers as classic rivalries. There are rivalry weeks in College football between colleges who usually are in the same state, region, or city. The intensity of these games is generally higher than that found in the rest of the season. The players are psyched. The fans go crazy, and quite often there are alcohol fueled acts of lunacy. Spots rivalries in this country pale in comparison with The Old Firm. The Old Firm is the name given to the meetings every year between Glasgow’s two Premier League Soccer clubs, Celtic and Rangers. One big difference between the Old Firm and our rivalries is the sectarian component. 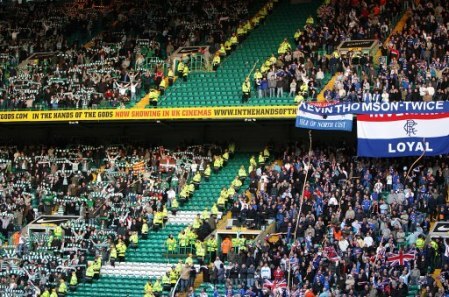 For reasons best left to your own research, Ranger fans tend to be Protestant, while Celtic are supported by Catholics. This is such a foreign concept to Americans that it is hard to believe. Believe it. It stretches from Glasgow, Scotland across to Northern Ireland, the last bastion of centuries old, and (thankfully) mostly abandoned, violence between Catholics and Protestants. Let me just state that this rarely has anything to do with how one chooses to worship. Again, do your own research. Ten years ago, on this weekend, I arrived in Belfast, Northern Ireland. The friends I stayed with live in a community called Andersonstown. 110 miles away in Glasgow, Scotland , The Old Firm was being played. We watched the match on TV. As Andersonstown, is a Republican (or Catholic) Community, my friend is a staunch Celtic supporter. Unfortunately, Rangers won on this day. Oh well, we’ll get em next time, right? Yeah right. While my friend was disappointed in the result, it didn’t ruin his weekend. He has a life, and had other things to occupy his time with. An hour or so after the match, I walked with him to a friends house in the nearby neighborhood of Lenadoon. We were going to pick up some tools for a home project. A couple blocks from our destination we heard a commotion. As we rounded a corner we saw some cars blocking the street as barricades. We had just come upon the fringes of a small riot going on. Young men, wearing Celtic gear, were dragging bicycle racks across the street, while others were shouting epithets at a line of riot police about 20 yards away up a small hill. My friend told me that most likely, out of our view on the other side of the police line, were Rangers fans who had come to taunt the Celtic fans. Without the police in full riot gear there would have been a drunken bloodbath. This is in another country across the water from where the game was played. I was heartsick when I read this. In a small town in a different country a group of drunken thugs used a game as an excuse to carry out a hate crime. I don’t have time tonight to examine the socio-politico-economic causes for the “religious” strife that happens over there. It’s a shame that there were no riot police in Coleraine this weekend.